Manchester, like the rest of the country, is trying to come to terms with the death of Diana, Princess of Wales. As soon as news of the tragedy came through, people from this area travelled to London to join other people at the gates of Buckingham Palace. At Manchester Cathedral, Archbishop Carey was one of the first to pay homage to Diana . He was staying with friends in Altrincham, and went to the Cathedral shortly after hearing the news. Many members of the public followed, and an evensong service, led by the Bishop of Manchester, the Rt Rev Christopher Mayfield, was held. A book of condolences has been opened, signed first by the Lord Mayor of Manchester, Gerry Carrol. Hundreds of members of the public are adding their names to the book at Manchester Cathedral. Other books of condolences have been set up at Town Halls around Greater Manchester and beyond. 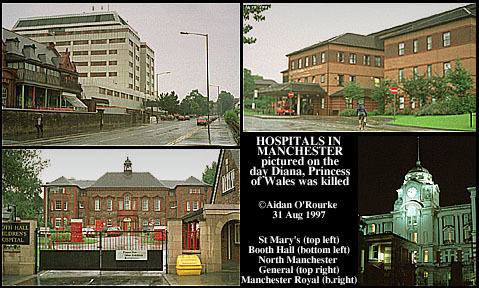 Diana's first visit to Manchester was in 1985 when she came to Wythenshawe Hospital to visit survivors of the British Airtours disaster. Her most recent appearance in the city was to open a detoxification centre run by the Turning Point charity in central Manchester. On churches, police stations and other public buildings around the city and surrounding countryside, flags have been flying at half mast in memory of Diana. The news came like a thunderbolt in the early hours of Sunday morning. Only a few hours before, Manchester city centre was lively, though much quieter than during the previous week's festival. As people woke up to the news, Sunday became, for many people here, a strange and unreal day. Many stayed in, watching tv all day. Later in the afternoon, the city centre became a little more crowded, though the mood was sombre, and there was only one story on everyone's lips. There were camera crews outside the cathedral, and later in the evening, I saw Northwest Tonight reporter Stuart Flinders walking across Oxford Road from the BBC TV centre, to fetch, apparently, a snack from the late shop. Shortly after he appeared on local tv screens with a news report from the region. Other media people were working overtime as well, none more so than at the Manchester Evening News, which managed within twelve hours of her death to come up with a Princess Diana special edition. The whole country waits expectantly for the funeral in London on Saturday, which will be a unique and unprecendented event, watched by millions all over the world. Other news stories have been pushed into the background by the sad events of the last 42 hours. In addition to two fatal car accidents during the week, reports came in of a bizarre suicide in the latter part of the week on Wilmslow Road, Fallowfield. A man set himself alight on the road, sustained 95% burns and died. The police weren't treating the incident as suspicious. There are plans to reintroduce traffic on Market Street, which was pedestrianised twelve years ago. Though visited by huge numbers of people during the day, the area is dead after dark, as people are reluctant to walk down there. The effect of allowing cars through would be to make the street more vibrant at night, though police fear the move may result in "ram-raider" attacks. The overall plan to redevelop the city involves bringing traffic into the centre at night, and is supported by Councillor for the city centre, Pat Karney. The week's weather has been very changeable, with a mixture of overcast skies, drizzle, bright periods, billowy clouds, blue skies and fresh winds. Yesterday, grey overcast skies during the morning made for a sombre mood, especially in the light of the day's events, but by the afternoon, rain cleared and sunshine came quickly, bringing bright rainbows over Middleton. 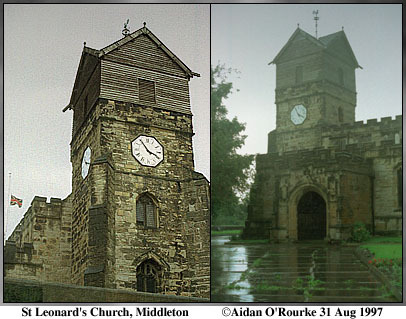 Today, the first of September was a similar story - the end of the summer seemed to be heralded by rain and cloudy skies, which looked like they might last for weeks, but two hours later, the sun was out and the evening was cool and clear. Fifty years ago, Manchester lost one of its foremost aircraft designers in a plane crash. Read about it in Manchester Eyewitness.